Oops! 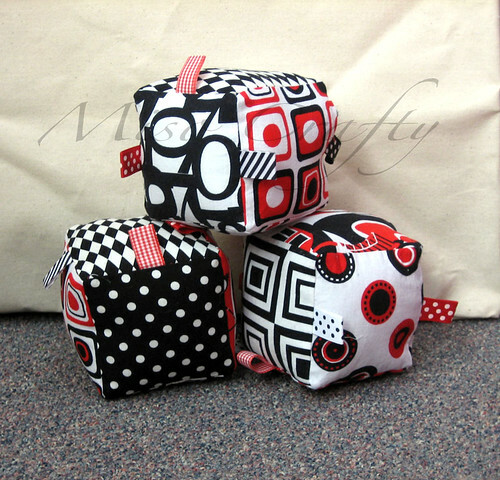 I had made these soft fabric baby blocks at the beginning of the year but completely forgot to blog about them! I had originally bought a bunch of fabric from the Michael Miller First Sight collection in hopes of making my son some crib sheets, a matching quilt, a hanging mobile, and if I had any fabric left over from the First Sight panel, I was going to frame some of the animals. Apparently babies love contrasting colors and the color combo of white, black, and red helps babies stimulate their visual learning. Anyways, I ended up not making any of the above cause a) I got a bunch of crib sheets at my baby shower; b) I ran out of time to make any of this before the baby was born; and c) half the fabric that I had either got ruined or lost in the move. Not that it matters too much cause I only had not even a handful of the prints from the collection and couldn't find the other prints in local stores, so I had to scramble to find fabrics that would suit what I did have. I was lucky enough to have some similar prints in my stash. I still wish I had the complete collection. I had decided to sew up these baby blocks after watching an episode of The Mom Show (Yes...who would've ever thunk it that I would be watching a television show called "The Mom Show"??). They had a segment about plastic and BPA-free toys, which then lead into another segment about learning toys. I don't remember exactly what they had said about soft baby blocks made from fabric, all I do remember was how cute their blocks were and thinking how easy it would be to make some. The ones on the show ranged from plain red, white, and black squares forming the block, and ones that were plain white with designs drawn on with fabric markers. A quick look at my stash of fabric and I knew that the remaining First Sight prints that I had would be perfect for this project! My blocks are made up from 4 inch squares. I had intended on them being 4 inches after they were made, but cause I had cut out the fabric at 2 in the morning, I had completely forgot to add seam allowances. I was hoping to have a different print for each side and was 2 prints short, so I ended up using the black and white polka dot fabric that I was saving to make some aprons with, and my really nice cotton, black and white striped Sevenberry fabric from Japan (you can't see it in the photo). One of the blocks on the show had some ribbon sewn across one of the sides, for texture purposes. So I took a quick peek into my trims stash (which is dwindling and then some...I must make a trip to Vancouver and to Dressew soon!) and discovered that I had quite a lot of ribbons in red, white, and black. Score!